What's a minor 6th chord ? 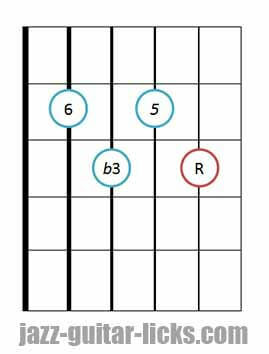 A minor 6th chord is built with four notes. 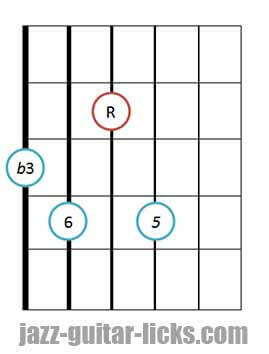 It is essentially a minor triad with a 6th of its related scale added. Therefore, it is made up of a root (1), a minor third (b3), a perfect fifth (5) and sixth (6). 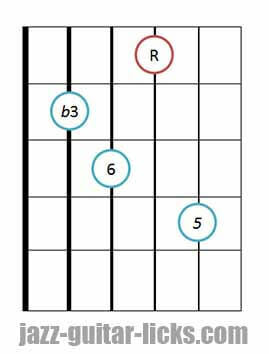 In comparison with the major 6 chord, it has a minor third instead of a major third. 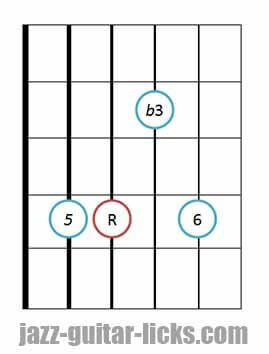 To build a minor 6 chord from a minor seventh chord, you just have to lower the minor seventh by a semitone. 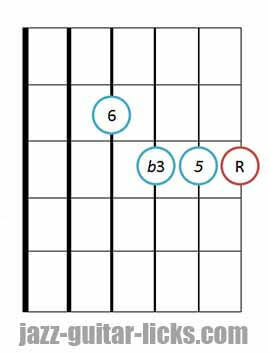 In the case of C minor, the sixth (A) is added to the C minor triad (C-Eb-G). So, Cm6 is built with C, Eb, G and A). 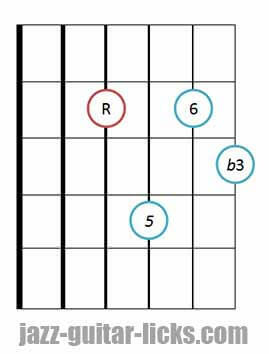 One interesting and useful thing to know about minor 6 chords is that they contain the same notes a m7b5 voicing. 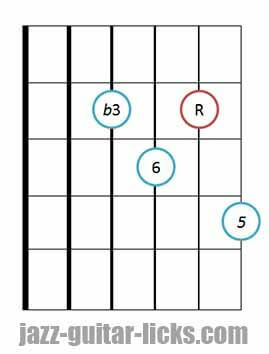 Indeed, a half-diminished seventh chord (m7b5) is made up of the same notes as a minor 6 chord three semitones higher. 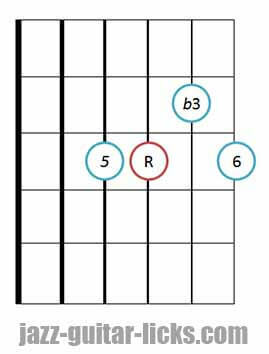 Minor 6 chords can be written m6 or min6. 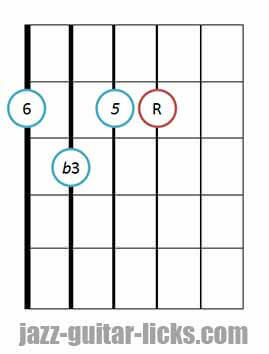 When a 6 is added to a four-note chord, this one is considered as the 13th. The presence of a seventh converts the sixth as an extension. 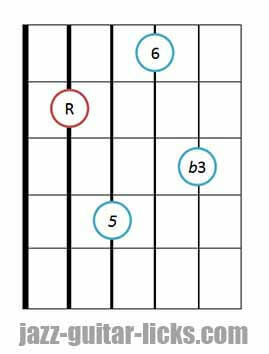 Here are the voicings related to the 12 minor 6 guitar chord shapes below. 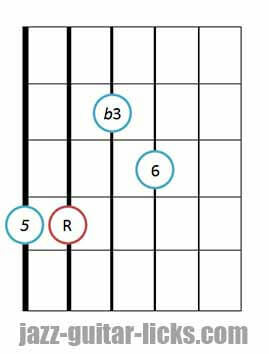 These positions are based on the drop 2 minor seventh guitar chords. By comparing them, you will see that the sixth has simply replaced the minor seventh. 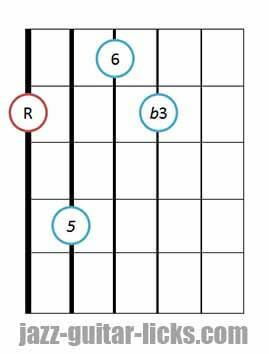 The two diagrams below show you how to play minor 6th arpeggios on guitar in order to associate them with the minor 6 chord voicings previously seen.